Classic Milkshake IPAs start as a hazy New England-style IPA with juicy hop sensations, then lactose sugar (milk sugar) is added for sweetness and body. Renegade #020 is similar, but with a nod, to classic West Coast IPAs. 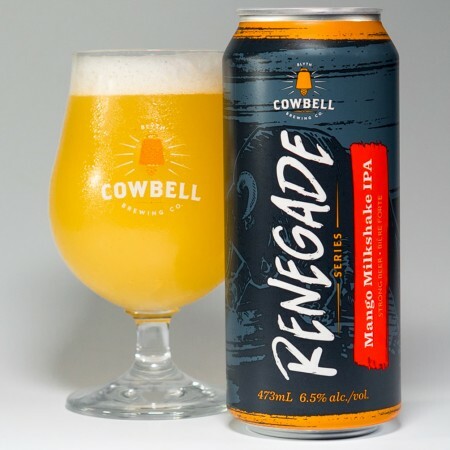 Brewed with fresh mango, lactose sugar and aromatic juicy hops, then fermented with Vermont Ale yeast, this Renegade Beer is a tropical hop milkshake in a can. Juicy with a big punch of citrus. Sweeter than most IPAs, but not overly, and with a fine dry finish. And yes, very hazy. Mango Milkshake IPA will be released on July 27th in 473 ml cans exclusively at the Cowbell taproom and retail store in Blyth. It will also be on tap at Cowbell and select bars in Ontario during the month of August.